By assigning descriptive names to cells and Excel ranges, you can go a long way toward keeping on top of the location of important information in a worksheet. Rather than try to associate random cell coordinates with specific information in Excel 2019, you just have to remember a name. You can also use range names to designate the cell selection that you want to print or use in other Office 2019 programs, such as Microsoft Word or Access. Best of all, after you name a cell or cell range, you can use this name with the Go To feature to not only locate the range but select all its cells as well. It’s always a good idea to use range names in worksheets for all the previous versions of Excel designed for desktop and laptop computers. With this new version of Excel designed for touchscreen devices, such as Windows 10 tablets and smartphones, as well, it’s easy to become a fanatic about their use. You can save yourself oodles of time and tons of frustration by locating and selecting the data tables and lists in your worksheets on these touch devices via range names. Contrast simply tapping their range names on Excel’s Name box’s drop-down list to go to and select them to having first to swipe and swipe to locate and display their cells before dragging through their cells with your finger or stylus. e name together. For example, instead of Profit 01, use Profit_01. Range names must be unique within their scope. 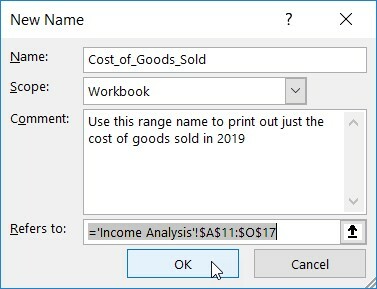 That is, all of the Excel worksheets in the workbook when the scope is set to Workbook (as it is by default) or just a specific sheet in the workbook when the scope is set to a particular worksheet, such as Sheet1 or Income Analysis (when the sheet is named). Click Formulas → Defined Names → Define Name (Alt+MZND) to open the New Name dialog box. Naming a cell range in the Excel worksheet in the New Name dialog box. 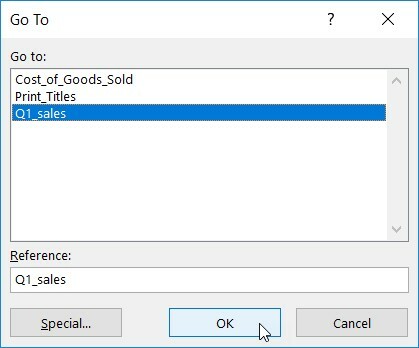 (Optional) To limit the scope of the Excel range name to a particular worksheet rather than the entire workbook (the default), click the drop-down button in the Scope drop-down list box and then click the name of sheet to which the range is to be restricted. (Optional) To add a comment describing the function and/or extent of the range name, click the Comment text box and then type your comments. Check the cell range that the new range name will encompass in the Refers to text box and make an adjustment, if necessary. If this cell range is not correct, click the Collapse button (the up arrow button) to the right of the Refers To text box to condense the New Dialog box to the Refers To text box and then click the appropriate cell or drag through the appropriate range before you click Expand button (the down arrow to the right of the text box) to restore the New Name dialog box to its normal size. Click the OK button to complete the definition of the range name and to close the New Range name dialog box. When typing the range name, you must follow Excel’s naming conventions listed above. To select a named cell or range in an Excel worksheet, click the range name on the Name Box drop-down list. To open this list, click the drop-down arrow button that appears to the right of the cell address on the Formula bar. You can also accomplish the same thing in Excel by selecting Home → Find & Select (with the binoculars icon) → Go To or by pressing F5 or Ctrl+G to open the Go To dialog box. Double-click the desired range name in the Go To list box (alternatively, select the name followed by OK). Excel moves the cell cursor directly to the named cell. If you select a cell range, all the cells in that range are selected as well. Select the named cell range to go to in an Excel workbook. It’s doubtful that anyone would dispute that the function of the formula =Hours*Rate is much easier to understand than =I3*J3. Assign range names to the individual cells. For this example, give the name Hours to cell I3 and the name Rate to cell J3. Place the cell cursor in the cell where the formula is to appear. For this example, put the cell cursor in cell K3. Select the first cell referenced in the formula by selecting its cell (either by clicking the cell or moving the cell cursor into it). For this example, you select the Hours cell by selecting cell I3. Type the arithmetic operator to use in the formula. For this example, you would type * (asterisk) for multiplication. Select the second cell referenced in the formula by selecting its cell (either by clicking the cell or moving the cell cursor into it). For this example, you select the Rate cell by selecting cell J3. Click the Enter button or press Enter to complete the formula. In this example, Excel enters the formula =Hours*Rate in cell K3. You can’t use the fill handle to copy a formula that uses cell names, rather than cell addresses, to other cells in a column or row that perform the same function. When you copy an original formula that uses names rather than addresses, Excel copies the original formula without adjusting the cell references to the new rows and columns. Having trouble with your Excel formula? Find out how to decipher error values in an Excel formula. Certain formulas use constant values, such as an 8.25% tax rate or a 10% discount rate. If you don’t want to have to enter these constants into a cell of the worksheet in order to use the formulas, you create range names that hold their values and then use their range names in the formulas you create. Click the Define Name button on the Ribbon’s Formulas tab or press Alt+MMD to open the New Name dialog box. In the New Name dialog box, type the range name (tax_rate in this example) into the Name text box. Be sure to adhere to the cell range naming conventions when entering this new name. (Optional) To limit the scope of range name defined to just a particular worksheet instead of the entire workbook, click the name of the sheet on the Scope drop-down list. Normally, you’re safer sticking with the default selection of Workbook as the Scope option so that you can use your constant in a formula on any of its sheets. Only change the scope to a particular worksheet when you want to use the same range name on multiple sheets of the workbook or you’re sure that you’ll use it only in formulas on that worksheet. Click in the Refers To text box after the equal to sign (=) and replace (enter) the current cell address with the constant value (8.25% in this example) or a formula that calculates the constant. Click OK to close the New Name dialog box. Type the range name to which you assign the constant at the place in the formula where its value is required. Click the Use in Formula command button on the Formulas tab (or press Alt+MS) and then click the constant’s range name on the drop-down menu that appears. Also, when you update the constant by changing its value in the Edit Name dialog box — opened by clicking the range name in the Name Manager dialog box (Alt+MN) and then clicking its Edit button — all the formulas that use that constant (by referring to the range name) are automatically updated (recalculated) to reflect this change.